As one of five kids, allowance meant everything to me as a child. My mom bought everything we needed, so it was only through allowance that I was able to purchase the things I really wanted. Money was a very taboo subject for my family. I had no idea what my father made or how much things cost. Today’s society is much more transparent, and it’s important to be open with your kids about money, especially in regards to chores and allowances. While I harbor no ill feelings about the way my financial education was handled, I do want my kids to have more solid footing when it comes to finances, saving, and spending. My children are currently seven and four years old, and a few months ago, I decided it was time to institute an allowance to pay for chores. While we’ve experienced some growing pains along the way, my husband and I have finally gotten the hang of it. As I was researching different ways to approach an allowance, I found there are two types of people – those who “pay” their children for chores, and those who simply expect their children to do chores because they’re members of the family. While I do agree that kids should pitch in because they’re part of a family, I also believe chores can be a good way to teach work ethic, and that an allowance is only provided when it’s earned. Define Chores in Relation to Allowance. Chores associated with an allowance should be contingent upon your child’s performance. If you ask one of your kids to load the dishwasher, and he or she does a poor job, you should have the option to ask for a redo or withhold the allowance. In the professional world, cash flow is directly related to work production and performance, so it’s important to start teaching kids at a young age that money is earned. As a child, I didn’t receive guidance on spending or saving. When I received my allowance, I felt free to do whatever I wanted with it, and I continued to be a diehard spender well into adulthood. That’s why I’m dedicated to teaching my kids the importance of spending money wisely. Split Funds Into Categories. Give your kids a piggy bank that splits money into three sections: one for spending, one for saving, and one for giving. Explain to your kids what each category is for, and why setting money aside for saving and giving is so important. Start a Dialogue About Money. Talk about the difference between investing in something that lasts, such as a high-quality leather football, and buying items that provide short-term enjoyment, such as candy. Kids should learn that money and purchases carry value, so it’s important to consider the long-term effects of spending and saving, rather than just the immediate result. Recently, my daughter asked for a toy from a popular build-your-own bear store. The price was much too high to justify buying the item outright, so I gave her the opportunity to save her own money and earn the toy by doing extra chores. For inspiration, we printed off the online product page with the listed price. I was amazed at how dedicated she became to earning the toy. After three months of careful budgeting, she saved every penny and purchased the stuffed animal herself. In addition to the gratification she experienced from earning her own toy, she also learned its value, and as a result, she takes better care of it than she does any of her other toys. Set Simple Goals. Acknowledge that children are short-sighted by nature. It’s hard for little minds to understand the concept of the future when their most important concern is what’s on the lunch menu tomorrow. Help them set future goals that they can reasonably attain in a relatively short period of time. Don’t Over-Complicate. Financial goals should help kids work toward specific rewards, such as a video game, toy, or special experience. By giving your child something to look forward to, chores become a priority, and your kids are less likely to waste their allowance on cheap stuff. Don’t over-complicate their budgets. A simple chart indicating how much money is coming in and how much goes out is enough to help your kids understand and plan for future purchases. These are the skills your kids need to learn as they grow into adulthood and start managing their own finances. One argument against paying your child for chores is that he or she will eventually request more money for doing the same activities. I agree 100% with this statement, but I don’t think this is a negative thing. A 10-year-old without many monetary concerns may agree to a $5 allowance for mowing the lawn, but when he or she turns 16 and wants to save for a used car, $5 may no longer be substantial motivation. Instead of automatically turning down an allowance increase, give your child the chance to negotiate a better rate. Encourage Negotiation. Allow your child the chance to discuss his or her current allowance and chores, bringing valid and substantiated arguments to the table when negotiating a better rate. For instance, encourage your son or daughter to research the going rate for lawn service, as well as the typical minimum-wage salary for a high school student in your area. If he or she is turning down hours at a part-time job to help out around the house, the argument for an increase in allowance is certainly valid, and by listening to the negotiation, you enable your child to feel included in family finances. Find a Compromise. If your child wants a better rate for mowing the lawn, you have the opportunity to negotiate for other landscaping. Perhaps you offer $10 per week if he also weeds the garden. It’s a win-win when you both get what you want, and you have the chance to teach your child skills he or she will need as an adult. One of the best ways to teach your kids about money management is to offer lots of praise. When your kids do their chores and spend their money wisely, let them know you recognize their smart behavior. Suggest, Don’t Nag. Offer gentle, positive suggestions for spending and saving. While your kids may not always spend the way you want them to, remember that when you give an allowance, you’re giving them the power to choose. By reminding your children, “Here’s your allowance – are you getting close to your savings goal?” you help keep your children on track without turning into a nag. Give Specific Praise. Say, “Hey, thanks for going the extra mile and taking out the trash when you cleaned the TV room – I really appreciate it,” to reinforce your child’s good behavior. When you notice your child saving for a specific item, drop a couple extra dollars in his or her piggy bank to support smart spending. Ultimately, the way you choose to teach your kids about money is completely personal and should be adapted to meet your family’s needs. What works for my family may not be right for yours, so don’t be afraid of a little trial and error. The important thing is to teach your kids that they’re responsible for their finances, and shouldn’t always rely on the Bank of Mom and Dad. Starting this process early helps set the foundation for smart financial decisions in the future. 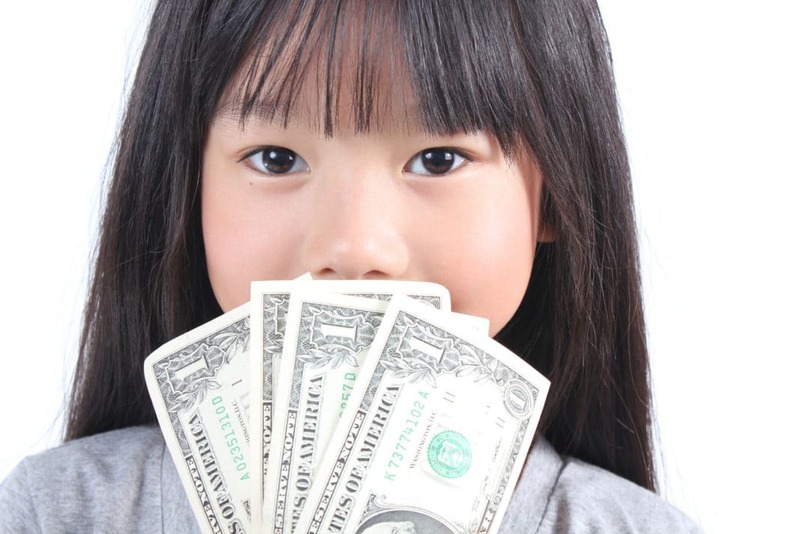 How do you teach your kids about money? Do you think children should be paid for chores?